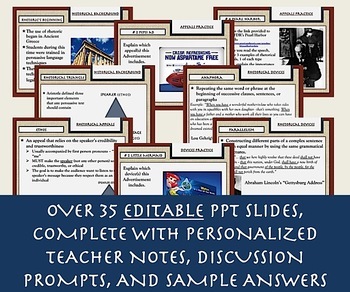 This comprehensive lesson will introduce students to rhetoric in a rigorous and relevant way by providing them with detailed notes, examples from noteworthy American speeches, numerous opportunities for practice and discussion, and a chance to show their mastery of the topic with a multiple-choice and matching assessment at the end. It also features detailed guided notes and answer keys for all of the activities included. 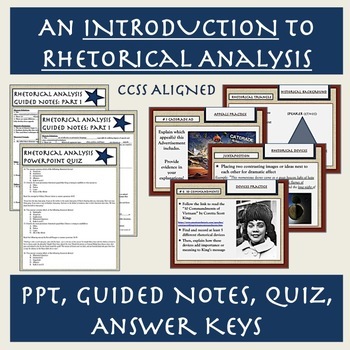 Together, these custom materials will provide students with a thorough, engaging, and rigorous introduction to a very complex analytical topic. They will not only be able to define the components of rhetoric in detail, but will also be able to critically assess the world around them. I hope you and your students enjoy! 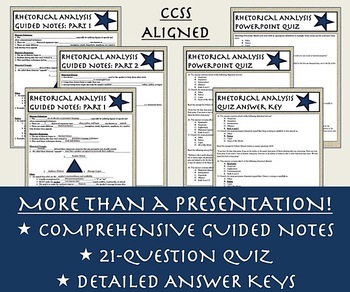 Check out my other 21st Century Rhetoric Products!